1) About that time Antiochus retreated in disgrace from the region of Persia. COMMENTARY: Not actually about that time. The writer takes liberty with the timing to compress the story and lump the telling of certain events together. 2) He had entered the city called Persepolis and attempted to rob the temples and gain control of the city. Thereupon the people had swift recourse to arms, and Antiochus’ forces were routed, so that in the end Antiochus was put to flight by the people of that region and forced to beat a shameful retreat. COMMENTARY: He’d attempted to loot the temple of “Aphrodite”—most likely Astarte or Inanna. COMMENTARY: Anger puts the body under tremendous stress, weakening the immune system. Same for insisting on a marathon without breaks. And his injustice of mistreating the horses who pulled his chariot compounds his sins, which is never healthy. 5) So the all-seeing Lord, the God of Israel, struck him down with an incurable and invisible blow; for scarcely had he uttered those words when he was seized with excruciating pains in his bowels and sharp internal torment, 6) a fit punishment for him who had tortured the bowels of others with many barbarous torments. COMMENTARY: From the few clues available, medical opinion says this was “most likely” an intestinal inflammation. 7) Far from giving up his insolence, he was all the more filled with arrogance. Breathing fire in his rage against the Jews, he gave orders to drive even faster. As a result he hurtled from the speeding chariot, and every part of his body was racked by the violent fall. COMMENTARY: Some sources say that an illness killed him, others say a fall. This account takes the position that both killed Antiochus between them. A man doubled over with pain couldn’t hold on very well in a speeding chariot. And what lesson does this offer for us? How often our own bodies warn us that we’re headed in the wrong direction in life, informed by the psychosomatic link, and yet we hurtle on all the faster to our own destruction! I remember, when I tried to go back to medical transcription, how the foot with which I habitually pushed the dictation-machine’s pedal broke in my sleep without any reason except the insistence of my psyche. I tried to persist anyway, having two feet to choose from, as I thought. But when I limped on my way to the commuter train for a job at a new hospital, the other foot sprained, leaving me sprawling on the asphalt while crossing the street, completely unable to walk and desperately crying out for somebody to drag me to safety before some car could run over me. By no means is medical transcription a sin, but it was just fundamentally wrong for me at that time—that phase of my life had passed and I needed to let go of it. I had burnt out, and my body sabotaged me to get me free of it. 8) Thus he who previously, in his superhuman presumption, thought he could command the waves of the sea, and imagined he could weigh the mountaintops in his scales, was now thrown to the ground and had to be carried on a litter, clearly manifesting to all the power of God. COMMENTARY: This writer does love to point out irony. 9) The body of this impious man swarmed with worms, and while he was still alive in hideous torments, his flesh rotted off, so that the entire army was sickened by the stench of his corruption. 10) Shortly before, he had thought that he could reach the stars of heaven, and now, no one could endure to transport the man because of this intolerable stench. COMMENTARY: Apparently some of his injuries must have included open wounds, probably compound fractures: broken bones jutting through the skin, which carry a very high risk of infection even in these days when we know about sepsis. He might also have had deep abrasions, if he got dragged along by the speeding chariot before the driver could stop the horses. The worms, of course, would be maggots. In any case, inordinate pride leads to inordinate indignity. Many these days confuse pride with self-respect, but they are in fact nothing alike. Pride is hypersensitive, and can fly easily into a reason-toppling rage at any threat to itself, whereas self-respect is confident and unperturbed; what the proud see as a threat, the self-respecting see as a lesson and a chance for further self-improvement. The self-respecting love to improve, but the proud seek to appear as if they need no betterment. COMMENTARY: Sometimes our afflictions can be a blessing, for they break through our masks and our self-delusions. The reason pride is so sensitive is that it cannot survive too much humiliation. Whereas self-respect can grow stronger from the challenge. COMMENTARY: The writer assumes that God would never show mercy to Antiochus, but he was not a prophet and had no way of knowing for certain. The continuation of hardships in this life is not automatically a punishment, but could be harsh medicine, or could have reasons having nothing to do with punishment or mercy at all. In this case I’d go with “harsh medicine”, because plainly his suffering lanced his swollen pride like a boil. COMMENTARY: Interesting that Antiochus would say “Athenians” when Athens wasn’t even part of the Seleucid Empire. For although the Athenian experiment in democracy went down in flames generations before, the name still invoked images of freedom and personal choice. 16) that he would adorn with the finest offerings the holy temple which he had previously despoiled, restore all the sacred vessels many times over, and provide from his own revenues the expenses required for the sacrifices. COMMENTARY: Clearly he’s in the bargaining stage of facing his mortality. 17) Besides all this, he would become a Jew himself and visit every inhabited place to proclaim there the power of God. COMMENTARY: Jewish tradition is not as avid for converts as Christianity. By their traditions one must ask three times before being accepted as a convert. Christians, on the other hand, accept deathbed conversions, and even hope in the possibility of a conversion after one has lost the ability to speak of it, just in case. The real question for Antiochus is how God heard this profession of faith. Was it a true conversion, or delirium? 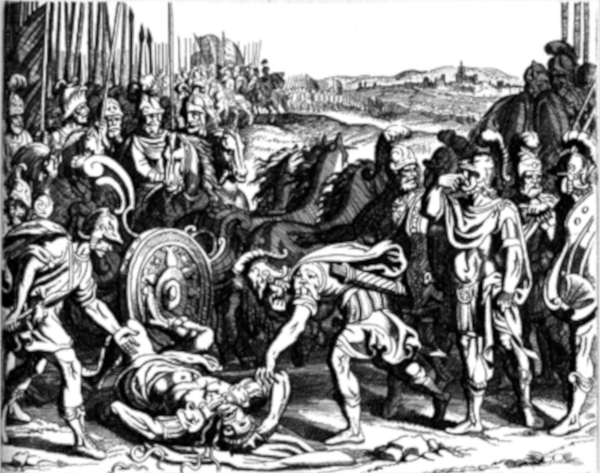 COMMENTARY: Applying a Christian perspective not intended by the writer, I would say that, rather than refusing aid, God might have wanted to take the life of Antiochus at the ripest point for harvest, lest he recover only to fall back into his old, tyrannous ways. 19) “To the worthy Jewish citizens, Antiochus, king and general, sends hearty greetings and best wishes for their health and prosperity. COMMENTARY: Apparently Antiochus sent out a form letter to all of his subject nations, changing only this first line to specify whichever people he addressed. 20) If you and your children are well and your affairs are going as you wish, I thank God very much, for my hopes are in heaven. COMMENTARY: People could read into that whichever deity they regionally worshiped. 21) Now that I am ill, I recall with affection your esteem and goodwill. On returning from the regions of Persia, I fell victim to a troublesome illness; so I thought it necessary to form plans for the general security of all. COMMENTARY: The people of Judea would doubtless hear that first sentence as ironic, considering their battles with his forces. 22) I do not despair about my health, since I have much hope of recovering from my illness. 23) Nevertheless, I know that my father, whenever he went on campaigns in the hinterland, would name his successor, 24) so that, if anything unexpected happened or any unwelcome news came, the people throughout the realm would know to whom the government had been entrusted, and so not be disturbed. COMMENTARY: He has to claim to expect recovery, in hopes of delaying the scrambling for his throne at least until after his death. And so he tried to make it sound as if he merely took a prudent precaution. But had mere prudence motivated him, he would have written this letter when his father would have, before he’d even set off. 25) I am also bearing in mind that the neighboring rulers, especially those on the borders of our kingdom, are on the watch for opportunities and waiting to see what will happen. I have therefore appointed as king my son Antiochus, whom I have often before entrusted and commended to most of you, when I made hurried visits to the outlying provinces. I have written to him what is written here. COMMENTARY: He makes it sound good to appoint a nine-year-old boy who’d mainly acted before as a puppet regent now and then under the real regency of General Lysias. 26) Therefore I beg and entreat each of you to remember the general and individual benefits you have received, and to continue to show goodwill toward me and my son. COMMENTARY: By now the Judeans must be rolling on the ground with laughter. COMMENTARY: They’re hoping he doesn’t follow his father’s policies at all! 28) So this murderer and blasphemer, after extreme sufferings, such as he had inflicted on others, died a miserable death in the mountains of a foreign land. COMMENTARY: “And let that be a warning to all who want to tyrannize us!” would be the lesson that the Egyptian Jews got from this. 29) His foster brother Philip brought the body home; but fearing Antiochus’ son, he later withdrew into Egypt, to Ptolemy Philometor. COMMENTARY: “Foster brother” here merely meant a title for an official high in Antiochus IV’s esteem, “Like a brother to me” and does not mean that they were actually raised together.